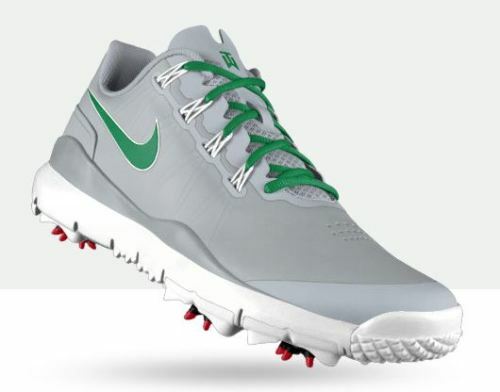 Prior to getting tasked with this review for Nike Golf I had seen the NikeID concept online, but it was for basketball shoes rather than golf shoes. I thought it was cool idea, but never really gave much thought relating to something that I’d ever do. When I found out I’d be doing a review on a new set of TW ‘14 golf shoes I was super excited. Having the ability to customize your own pair of shoes is such a cool idea and something that I should have seen coming. Unless you’ve been living under a rock the last couple of years you’ve noticed the not so subtle splash of color that golfers are adding to their apparel. I think it’s great to see and I couldn’t wait to get started building my pair. The design process was very simple. Nike gives you basically a blank canvas or if you’d like they have some of the more popular designs there to act as a template. Every detail down the color of Flywire and shoelaces is completely up to you. My initial designs were all over the spectrum from basic to completely off the wall and very colorful. Upon getting the link and all the information I need to begin my design I decided that I wanted to involve the great members of the THP community and have them help me with the design. I created a thread on our forum and the suggestions started flowing in. Everyone commented how easy it was to wind up getting lost in the fun they were having just coming up with different and sometimes crazy combinations. We had several forum members participating in the designs and at the end I narrowed what I thought were the top four designs and put them up to a vote of our members. The winning design would be what I ordered. In the end the design by forum member Golf Ghost was the winning design. A nice and rather simple design compared to some of the entries we saw, Golf Ghost stuck with a gray base with green trimming and won the design contest in a landslide. The ordering process was simple. I followed the design chosen and I was set in a matter of minutes. At that time I was told delivery would be 6 weeks from the date of order, which seemed reasonable. I was notified via email every step of the build process and to my surprise my original 6 week wait time was cut down to about 4 weeks. I love when a company under promises and over delivers – exactly the case in this situation. Tiger Woods debuted the Nike TW ‘14 at the 2013 Players Championship, where the latest in footwear technology helped power him to his 78th PGA victory. With Nike Free-inspired technology and design, the TW ‘14 delivers the freedom and support to unleash the full power of your swing. When the shoes arrived I wasn’t sure how closely they would resemble the design that was submitted. I’ve seen many online designs of various products arrive only to look way different in person. The TW ‘14 showed up looking exactly as they did online, but even better. I opted for the all-leather waterproof version in my shoe, but users can opt for a breathable mesh design as well. The customization varies slightly depending on the model you go with, but I’m happy to report that in person they look even better than they do in the online design tool. The TW ‘14 fit true to size for my feet. 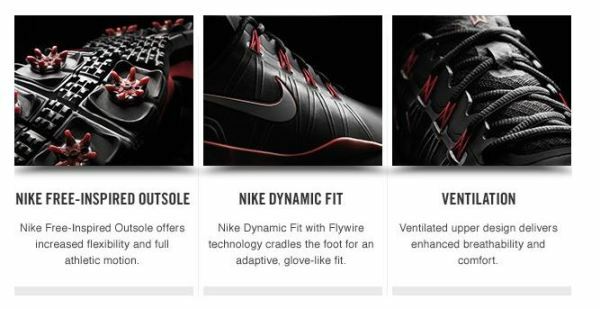 The TW ‘14 features Nike Dynamic Fit with Flywire technologies that not only look really cool, but also makes for a fit and comfort that almost feels tailored to your foot. 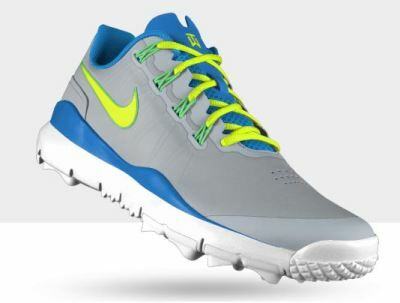 I can say without hesitation that the Nike TW ‘14 is the most comfortable golf shoe I’ve ever worn. I know that I could easily lace up a brand new pair and walk 18 holes and not have a single issue. 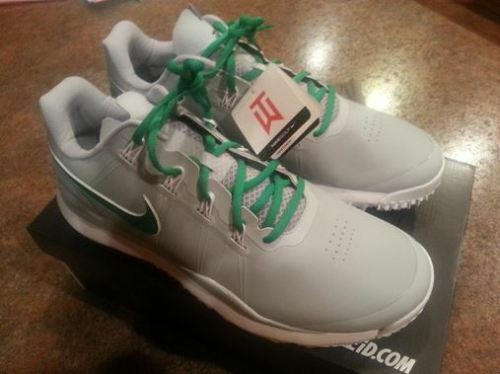 Something that I had always wondered about the Nike Free design of the TW line of shoes was the support. Because they are so flexible and move with your foot I did not know if support would be something of strength. I was wrong and it became immediately apparent the minute I put these on for the first time. That support carries over to the course as well. I never once felt anything close to a lack of support when wearing these while playing golf. I’ve been anxious to get an up close look at the TW ‘14 since Tiger started wearing them last season and they did not disappoint. I believe Nike has taken a lot of feedback from the initial Nike Free renditions and improved and adapted where needed. The TW ‘14 is the best looking TW golf shoe to date in my opinion and that’s without going the route of customizing your own. The fact that golfers can now design their own shoe to reflect their personality is really something cool in my opinion. A new pair of stock TW ‘14 cost $179 and if you choose to design your own they’ll run you $225. I can see people getting a little sticker shock when seeing the price tag, but as I mentioned early I believe these are the most comfortable golf shoes I’ve worn to date. In addition, the waterproof synthetic leather upper means that your feet will not only stay comfortable, but they’ll also stay dry. It’s hard to put a price tag on that in my opinion. Now that I’ve got this great looking custom pair I’ll will certainly be adding another pair to my collection so that I can enjoy the benefits of these golf shoes every time I play. Great review, Jake! 2014 might just be the year of the shoe with all these big releases, but the TWs being “the most comfortable shoe” you’ve ever worn makes me ponder. Price tag is a little hefty for a custom option, but I believe the stock price is on par with a lot of the higher-end shoes that have come out/are coming out. Man, my 2014 shoe choice is not getting any easier. Very cool review Jake, those look great and having the ability to customize them and make them your own makes them even better. Great review! I really like the looks of the shoe and I think Nike has done a great job of making a functional yet comfortable shoe. Add in the fact that you can make it personal, that is a great idea. Great review and those shoes look great! I will be choosing between the TW and the Lunar Controls this year. Both really great shoes, IMO. The customizing part is so awesome. Nice write up Jason, stylish looking steps. Process seems easy enough, may have to check out. Great writeup Jake. Love the green and grey look in the pic. Still not a fan of the tongue, it just looks lethal. Glad to hear the comfort continues to be up to par though. Great job Jakester. Does anyone know if they fixed the flaw on the 2013 version that caused some guys some issues? I know JB had an issue with the tongue being too long I believe? Yep, that confirms it for me, I will own the 14’s. Great review Jake. Great work Jake, I love the color scheme and the customization really adds a great option for consumers! Great review, and so neat that the colors were chosen by the forum. I like the custom color choices, and who doesn’t want a shoe that is comfortable right out of the box? Great thoughts Jake, these look so much better than the first generation. Nice review here Jake! While pricy, we pay for a custom option and all things being equal these are not that much more expensive than comparable “non custom” shoes. Your feedback is very impressive as to the comfort factor of these shoes, looking forward to seeing what your second pair will look like! I wonder why gray & green won the design competition? Couldn’t have anything to do with the THP masthead colors could it? Maybe we’re not so much independent designers as team followers. They really turned out nice. It was a good time making designs and hearing the comfort is there is very nice. Thanks for the thorough review Jakester. Awesome review Hasin and those shoes rock. Just seeing the in hand photos perked my interest. Fun writeup Jason. Question for you. They are advertised as being a bit wider in the toe area. I always wear wide width and sometimes they still squeeze the toes a bit. 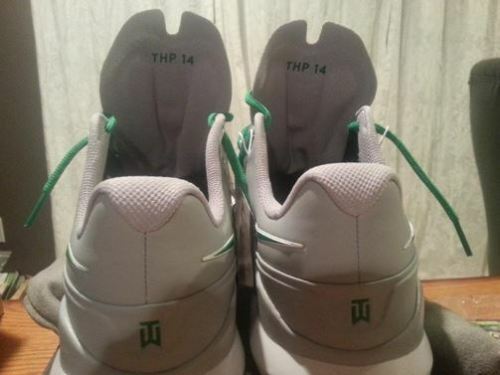 What did you notice about the TW14s? Nice write up Jake. I really love the design that the forum came up with, I can’t wait for some long term thoughts on them. Thanks for the review Jake. Not a completely ridiculous price tag considering the complete level of customization. Those really are shoes made specifically for the individual ordering them.